Despite their choice of questionable photography in some sets, Topps could take a good picture when they needed to. 1964's set of "giants" gave a great first look at oversized, color prints on card stock (set gallery here) and they soon followed with a series of poster inserts featuring individual players (1967, 1968) and full teams (1969). 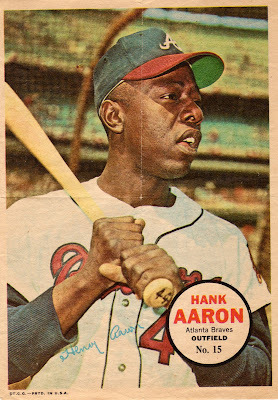 Hank Aaron had a comparative off year in 1966, the first in Atlanta after moving with the Braves from Milwaukee. Of course, he still led the league with 44 homers and 127 RBIs, but with "only" a .279 batting average. Gap power (and average) returned in 1967 and stayed high throughout his 30s (career stats here). The Hammer's bat handle proudly bears #44 and would never put up with the Billy Ripken treatment. Somewhere in the middle of the year, Topps added a poster to card packs as a promotional insert. 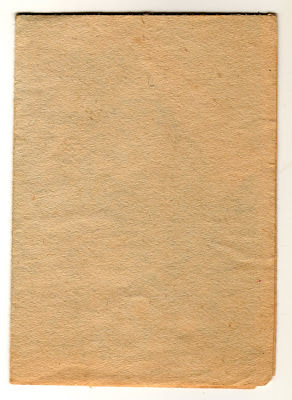 Only proof versions come without folds, and are thus exceedingly rare. The set includes some great pictures of and legendary players (set gallery here), but individual "cards" don't cost much. As I write this, HOF singles are on eBay for Buy-It-Now prices under $5.